Guest speaker Scott Lewandowski spoke to Memorial attendees about the sacrifices made by service people during the war with Korea from 1950 to 1953. Rob Wise stands in front of the ‘57 Ford that he bought and refurbished to look like the first squad car his father, Robert Wise, had when he started as a State Trooper with District 16. 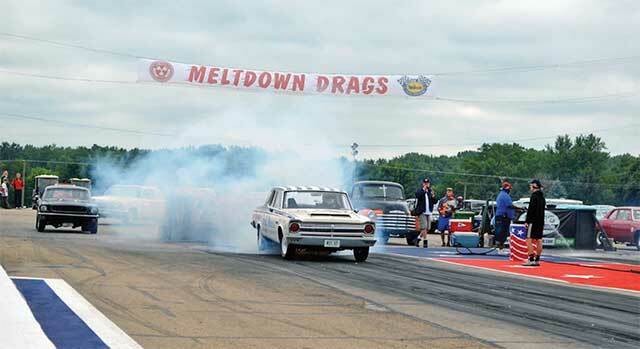 A Plymouth Belvedere, driven by Larry Griffith and sponsored by Ferris Motors of Savannah, IL, burns some rubber at the Meltdown Drags held at Byron Dragway this pat weekend. Durand High School cheerleaders were recently recognized as recipients of the Premiere Cheer Camps Award of Excellence at their summer cheer camp hosted by the private cheer camp company, Premiere Cheer Camps. Sightseeing in Paris: (L-R) Shannon Shrader, Kim Shrader, Leanne Shrader, Annika Waldron, Angelina Waldron, Chloe Nestler and Kelly Nestler. Four Byron Middle School students recently played at Carnegie Hall in New York City; (L to R) Grace Voiles, Kaci McKnight, Sally Albrecht, Alex Cassens, Mia Vongsiri. Gracie Williams stands with an enlarged check depicting the total of $2,585.